L K - It's turkey time! 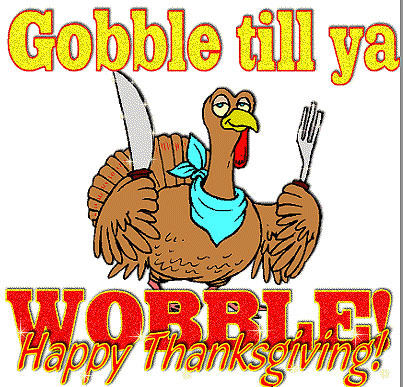 Click to hear me "Gobble!" Thanksgiving is perhaps the greatest of all holidays. It brings together families and friends to consume massive amounts of food without the obligation of giving a gift. That's my kind of holiday! In the spirit of giving "thanks" and of Thanksgiving, we present several links that will assist you in demonstrating attitudes of gratefulness during this wonderful holiday season! Relationship Article - An attitude of gratitude is faith in action. Want a grrreat relationship? Read "A Prayer of Thanksgiving!" For a special "Thanksgiving" surprise, click here! For some family fun on Thanksgiving, test yourself with "Thanksgiving Trivia! A lady was picking through the frozen turkeys at the grocery store, but couldn't find one big enough for her family for Thanksgiving. She asked a stock boy, "Do these turkeys get any bigger?" The stock boy replied, "No ma'am, they're dead." Here are some Organizational Tips for November from my friend Karen Ussery. George Washington's 1789 Thanksgiving Proclamation. Thanksgiving FUN for the KIDS. Here's a cornucopia of Family Fun for Thanksgiving. Some interesting facts about turkeys. Six tips for serving Thanksgiving leftovers. Books and Journals Written by the Pilgrims - Time for a little history of Thanksgiving written by the people who created this wonderful holiday. The Pilgrims themselves wrote relatively few things, but the things they did write are very significant. Here you will find links to the "full texts" of most all the books and journals ever written by the Pilgrims. Included is "Of Plymouth Plantation," Gov. William Bradford's history of Plymouth. What's the Fastest Way to Thaw a Frozen Turkey? - There are 3 safe ways to defrost a turkey to prevent your Thanksgiving from becoming a bacteria biohazard. Thanksgiving Puzzle - Find the words that relate to Thanksgiving. You will be timed. Give up? Click "solve game" and then choose another game. Hint: Some of the words are spelled backwards. Enjoy! "To give thanks in prosperous times may seem easy. To give thanks in difficult times may seem all but impossible. But it is never harder to give thanks at one time than at another, if the thanks be given in an understanding of God's invariable goodness." Gobble, Gobble, Hey! - Be prepared to laugh! This site features articles such as: "How to Win the Thanksgiving Day Food Fight," "How to Win the Wishbone Pull," "20 Thanksgiving Myths," "Thanksgiving Day Eating Games" and more. Check out All About Thanksgiving! National Turkey Federation - Browse a data-base of 500 recipies for such tasty surprises as turkey fajitas. 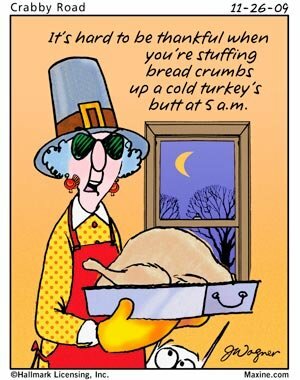 A Humorous Thanksgiving - This site features the humorous side of the nation's most popular autumn holiday including information on crafts, decorations, invitations and turkeys. The Turkey Book Shelf - Featuring a listing of over 500 books about Thanksgiving. Pumpkins - How to buy, store and cook pumpkins, plus lots of pumpkin recipes! Links for nutritional info/buying pumpkins, Jack-O-Lanterns, cooking fresh pumpkins, miniature pumpkins as individual baking and serving dishes and 21 pumpkin recipes. 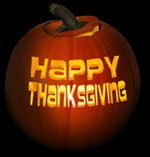 Thanksgiving Day - Offers information on history, quotes, facts, recipes, songs, poetry, and gifts ideas. But, I managed to yell as I soared past the trees. . . Thanks & Giving: All Year Long - Marlo Thomas - An exceedingly handsome book with enough stories, songs, poems, and beautifully reproduced art to make it a worthy purchase - especially since the proceeds go to St. Jude Children's Research Hospital. Larry's Review: Marlo Thomas has used her celebrity to organize a group of accomplished writers, artists, and actors to write stories about giving and being thankful. A great book for kids and adults AND it supports a worthy cause. "Gratitude unlocks the fulness of life. It turns what we have into enough, and more. It turns denial into acceptance, chaos to order, confusion to clarity. Gratitude makes sense of the past, brings peace for today, and creates a vision for tomorrow." To get a complementary trial subscription to my friend, Wes Hopper's "Daily Gratitude Newsletter," delivered monthly, click here and fill out a brief form. You can safely unsubscribe at any time with a click! You will also receive the FREE eBook "The Astonishing Power of Gratitude." www.123Greetings.com - Share gratitude! Send someone you love a very special Thanksgiving greeting card.